The western powers saw that modern China was a potentially powerful state which could shake the world. Therefore China was kept out of world politics by the west for several decades. That is now history. In June 2017, Judith Shapiro, speaking of China announced ‘the superpower has arrived’. China is set to become the first non-Western power in the modern era to shape the geopolitics of Eurasia and the Indo-Pacific, said Bandu de Silva. In 2017, Europeans increasingly named China rather than the US as the world’s leading economic power. World Economic Forum ranking for 2017 was USA first with GDP of USD 18 trillion, 24.3% of the world economy, followed by China with USD 11 trillion, and (14.8%). China said in 2017 that it can replace the U.S. as the leading financier of the world. U.S. has massive trade deficits with many countries, China has trade surpluses. Private Chinese firms are investing in the west. Beijing Construction Engineering Group is funding an airport in Manchester. Chinese firms also own football clubs and football players. China is the third largest shareholder in IMF and World Bank, next to US and Japan. But real power will come only with the ability to influence the policies of these institutions. This has still to come for China said analysts. China is now in the G20 as well. China has made known its views on world governance. Wang Youming, speaking at the BCIS seminar on contemporary China-Sri Lanka relations, Colombo, May 2017, said (as I understood him) that China does not wish to lead in global government. China does not support global governance by big powers, he said. ‘Big powers’ have no special right to dominate. All nations, whether big or small must rule. The sovereign power held by the government of a country is supreme. No other actor can replace it. China supports the UN Charter and believes in non interference in internal affairs of a country. The international NGOs supported by the west are not considered important by China. It is the government of a country that is important, not NGOs, he continued. The west uses Human Rights to interfere in other countries, but a military solution should be the last choice. Look at Syria and Iraq, Wang Youming concluded. China thinks in terms of regions, said another analyst. China is for regional integration. China specialist and former Secretary General, SAARC, Nihal Rodrigo, thought this a very positive approach. However, China is not simply gazing at regions. It is planning to function simultaneously in two of them. China wishes to belong to South Asia as well as East Asia. China says it shares borders with Pakistan, India, Nepal and Bhutan and is therefore a part of South Asia. China clearly wishes to play a strong role in this region. It has asked for membership of SAARC. Xi Jinping has said that South Asia could be the new growth centre of Asia. China needs a “world-class” army capable of “defeating all invading enemies”, said President Xi Jinping. China ‘seeks military clout commensurate with its economic might’ added analysts. China is setting up its first overseas naval base in Djibouti. It will be used to resupply navy ships taking part in peacekeeping and humanitarian missions off the coasts of Yemen and Somalia, says China. Global Firepower’s military strength ranking for 2017 is US, Russia, China and India. Global Firepower’s ranking for total navy strength, 2017 is North Korea first, followed by China then US. India is in 7th place. China possesses at least 42 ballistic missile submarines. China hosted a high level Belt and Road Forum (BRF) in Beijing in May 2017. It was attended by leaders of 29 countries, by heads of United Nations, International Monetary Fund and World Bank, by 1,500 delegates from 130 nations and representatives from 70 international organizations. Conspicuously absent were the leaders of India, US and most European states . However, US sent a delegation led by Matt Pottinger, Special assistant to the President and senior director for Asia at the National Security Council. A few Indian scholars attended the opening. China says its BRF is the ‘project of the century.” It will benefit people across the world. Nawaz Sharif, then Prime Minister of Pakistan, praised China’s vision and ingenuity. ”Such a broad sweep and scale of interlocking economic partnerships and investments is unprecedented in history”, he said. It is breathtaking in scope said an analyst. 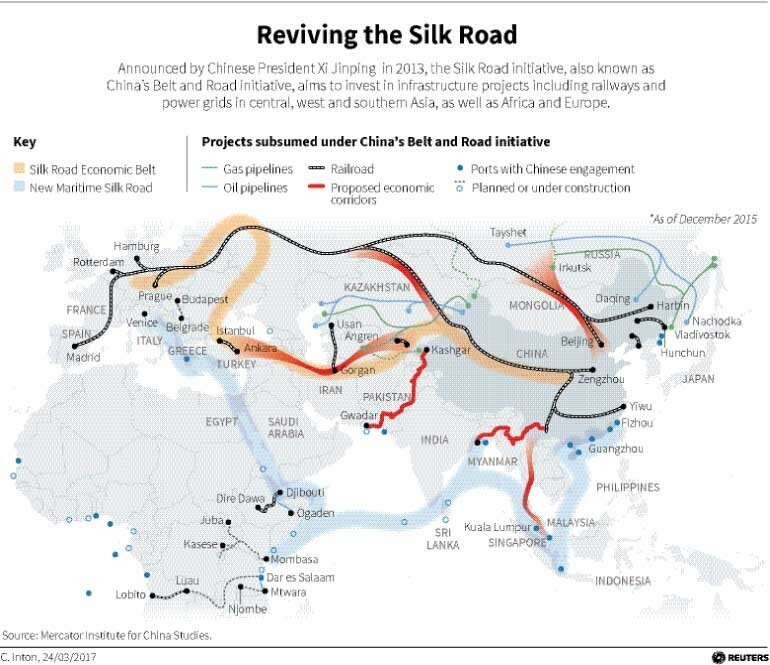 China’s Belt and Road Initiative (BRI) was first put forward by President Xi Jinping in 2013. It consists of two major components, the land-based Silk Road Economic Belt from Asia via the Middle East to Europe, and ocean based Maritime Silk Route connecting China’s port facilities with the east African coast, leading to Europe via the Red Sea and the Mediterranean. BRI’s goal is to establish a trade corridor across Eurasia to ensure swift and efficient transportation of goods from the east to the west on favorable terms. BRI spans some 65 countries representing 60% of the global population and around a third of global GDP. These countries, located in Africa, Asia, and Europe will be linked by land and sea for trade and investment, and this will benefit millions of people. We should foster a new type of international relations featuring win-win cooperation and we should forge partnerships of dialogue with no confrontation and of friendship rather than alliance, said China. BRI has a series of transport, energy and communications projects which will connect the vast Eurasian region. Six economic corridors are planned, China-Pakistan economic corridor, China-Mongolia- Russia corridor, China-Central Asia- East Asia corridor, China- Indochina peninsula corridor , China-Pakistan corridor and the Bangladesh-China-India- Myanmar corridor. These six corridors form a trade and transport network across Eurasia. China provided detailed information on BRF at the Beijing meeting. China said a network of new logistics routes and facilities will be constructed, including new highways, railways, ports, pipelines and power plants, along the routes to connect China with the Asia-Pacific Region, the Gulf region, Central Asia, Africa and Europe. There would be at least two industrial parks. China and Malaysia are building an industrial park in Kuantan, Malaysia, for steel, aluminum .deep processing and palm oil processing. In Eastern Europe, a China-Belarus industrial park for high-tech businesses broke ground in Minsk in July 2014, the largest one built by the Asian country overseas. The seaports in BRI include Lamu, a deep sea port in Kenya. Turkey’s third largest port, Kumport was bought by three state-owned Chinese enterprises. A trade route was inaugurated to link .Pakistan’s Gwadar port on the Arabian Sea, with Kashgar, a city in China’s northwestern Xinjiang province. The port will provide China with safer and more direct access to the oil-rich Middle East than the waterway trade route it currently uses through the narrow Malacca Straits. A new international airport will also be built in Gwadar. In the railway sector, China-Europe Railway Express including 51 rail links connecting 27 Chinese and 28 European cities, with freight trains that offer shorter transport time than sea routes. A planned 418-kilometre (260-mile) rail line between China and Laos will connect with the vast rail system in China. Once finished, it will be the longest and fastest in the southeastern Asian country. Another 873-kilometre high-speed railway project between China and Thailand will link the Chinese border to Thailand’s ports. It will transform southwestern Yunnan province into a trading hub that exports China’s goods to Southeast Asian markets. In Africa, there will be a 471-kilometre railway between Nairobi and Mombasa on the Indian Ocean coast. Passenger trains will zoom at 120 kilometers per hour, while freights will run at 80 kilometers per hour and carry 25 million tons of cargo per year. The BRF is attractive to its Eurasian partners as it would facilitate mutual development of their economies, said analysts. It focuses on Asian, European and African countries, but it is also open to all other countries. There are other benefits. Over the next five years, China plans to import $2 trillion of products from countries participating in this initiative. China will set up 50 joint laboratories with participating countries to enhance cooperation on innovation as well. China is able to finance these two huge BRI projects. China plans to contribute an additional 100 billion yuan to the Silk Road Fund, which was set up in 2014, taking it to USD 55 billion. China will also provide assistance worth 60 billion yuan to developing nations and international organizations participating in the Belt and Road initiative to launch more projects. The China Development Bank has earmarked USD 890 billion for some 900 projects. China has considerable economic power and enormous experience in infrastructure development and will have no difficult in accomplishing this project, say analysts. Chinese capital, labor, technology, industrial standards, commercial benchmarks and the Yuan will be active in these projects. Now to international relations. China has good relations with Russia. At the Belt and Road Forum Russia’s President Vladimir Putin addressed the forum immediately after the Chinese President. He observed that there will be a high-speed rail link from Moscow to Beijing that will reduce the current journey time from seven days to just 24 hours and a $20 billion Moscow-Kazan high-speed railway that will have trains running at speeds up to 400 kilometers an hour. Russia has signed a $400-billion deal to supply China with 38 billion cubic meters of gas annually from 2018 for 30 years. The 3,968 km pipeline linking gas fields in eastern Siberia to China will be the world’s largest fuel network in the world. China’s relations with India are troubled and uneasy. China has blocked India’s move to get Jaish-e-Mohammed chief Masood Azhar banned by the UN and has opposed India’s bid for membership of the Nuclear Suppliers’ Group. Nevertheless, the idea that China would not like to see India developing is wrong, said China’s ambassador to India, Luo Zhaohui. We are more than happy to help India develop in order to achieve common development. Good ties between the two countries are conducive to regional stability and in China’s interests, he said. The Chinese Ambassador to India has put forward a four-point initiative to overcome differences and deepen relations with India. The four points are: aligning China’s ‘One Belt One Road’ (OBOR) project with India’s ‘Act East Policy’, a ‘China-India Treaty of Good Neighbourliness and Friendly Cooperation’ a free trade pact and early resolution of the border dispute between the two countries. India is wrong in thinking that China puts Pakistan first before India, said the ambassador. I want to tell you this is not true. Simply put, we always put China first and we deal with problems based on their own merits, said the ambassador frankly. China will not get involved in the sovereignty and territorial disputes between India and Pakistan on the China Pakistan Economic Corridor (CPEC), which passes through Pakistan-occupied- Kashmir he added. However, China, it appears, is ready to poke its nose into the India-Pakistan disputes. China is willing to mediate to resolve differences, between the two countries if both sides accept it, said the ambassador. Countries like India and Bangladesh will be the first batch of beneficiaries of China’s efforts to build a network of roads and infrastructure facilities in South Asia said China. China’s economic cooperation with Sri Lanka will contribute not just to the local economy but to the whole region. India should rethink its stance toward the Chinese-funded projects in Sri Lanka. India should join in the development of Sri Lanka ports instead of feeling jealous”. China has quietly launched its own ‘Nalanda University’. Nanhai Buddhist College, Hainan, is situated on 618 acres in a beautiful seaward location in the Nanshan Mountains. Such a large campus could not have been built in one or two years. They must have started construction in 2012 said observers. The original Nalanda campus in Bihar, planned almost a decade ago, is still inactive. It is ‘stuck with 455 acre dead space’. Nanhai Buddhist College opened in May 2017 with 220 students . Ven. Yin Shun, abbot of Lumbini-based Zhong Hua Buddhist temple and Vice president of the Buddhist Association of China, has been appointed Dean of the university. Renowned scholars, professors, and senior teachers from the Buddhist community have been invited to join the academic staff. Nanhai has six subject departments, Chinese Buddhism, Temple Administration and Management, Buddhism and Life Sciences, Social Work and Charity Management, Meditation and Tea, Buddhist Art, and Buddhist Architectural Design and Preservation. Nanhai will teach in three languages, Pali, Tibetan and Chinese. Sanskrit will be replaced by Chinese. Nanhai is linked to the Buddhist centers in Sri Lanka, Nepal, Thailand and Cambodia. China has always been Sri Lanka’s true friend. Its place is even more heightened with Japan becoming a complete US puppet. Under Xi, China has become the global promoter of Buddhism and connected trade putting India to shame. Buddhists in India are only 0.7% and they are economically and socially deprived. Ancient Silk Road and Buddhist shrines were inter-connected as can be seen in East, South and Central Asia. Therefore, China’s twin strategy of reviving this ancient trade and social network is simply stunning. It combines both soft power and hard power. India and Japan are left isolated and without much leverage. Thank you Kamalika and Dilrook for some relief given by the information provided at a time everyone is waiting to destroy the Buddhist values from Mother Lanka. Hope the good days for the humanity are going to return. China is the worlds leading producer of industrial goods by weight and volume. Hinduthwa is in the process pf reconverting Dalit Buddhists back to Hindus. India already has trouble in the border and I hope China may dismantle the British made India. I agree with Dilrook on this point China is a true friend of Sri Lanka. This entry was posted on Tuesday, August 8th, 2017. You can follow any responses to this entry through the RSS 2.0 feed. You can skip to the end and leave a response.